Moses Walker thought he was going out for a quiet dinner with his family. Instead, two hundred people showed up and literally helped put his name up in lights. 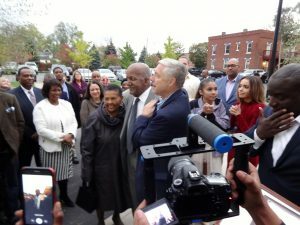 Walker, a prominent community leader and champion of social justice, was visibly moved as Family Health Center surprised him on Oct. 27, 2017, with a ceremony renaming its Paterson Street clinic the Moses L. Walker Building. 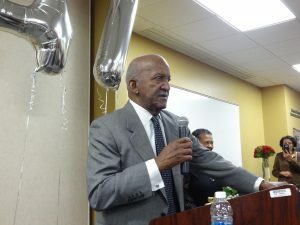 Walker, a long-time member of the Family Health Center Board of Directors, helped spearhead the creation of FHC in 1971—at the time a simple trailer at the current Paterson Street location. 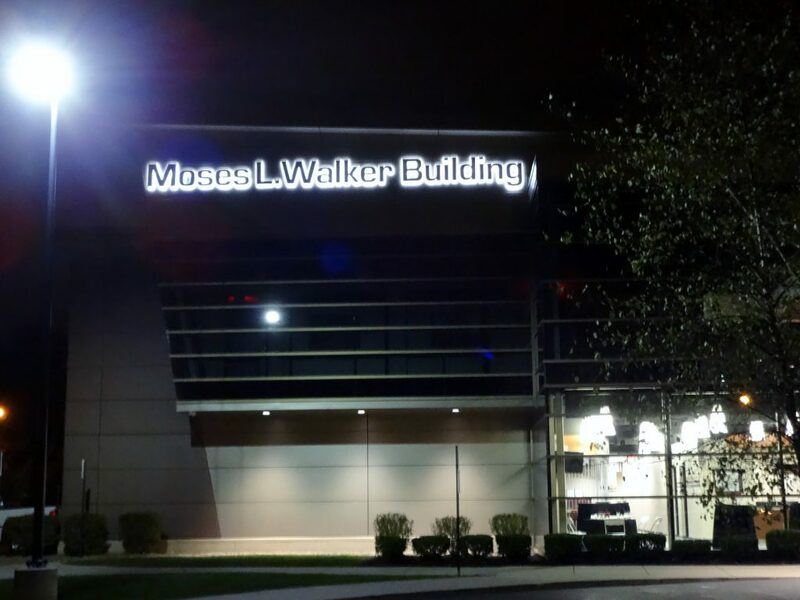 Today’s rechristened Moses L. Walker Building is a state-of-the-art health care facility providing care to thousands of underserved patients. Walker arrived at the Paterson campus on Friday evening with his family, who insisted he wear a blindfold. He removed it to see 200 people cheering outside the clinic. Moments later, workers on the roof released a tarp to reveal the new, LED-lighted sign with his name. He also received commendations from Kalamazoo Mayor Bobby Hopewell and Congressman Fred Upton. “Mr. 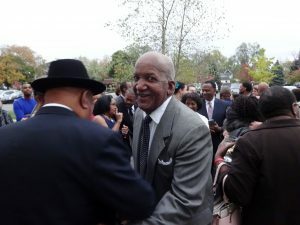 Walker has always been a pillar in our community,” Crawford told the crowd. “Regardless of how high he rose and all of his accomplishments, he never forgot the bridge that carried him over. He never forgot about the single mothers and their babies. He never forgot about the poor health outcomes and the staggering rates of diabetes and hypertension in our community. Inside the clinic, Walker listened for over an hour as friends and family thanked him for his tireless work for those in need. “To say that I’m overwhelmed would be an understatement,” Walker said. “It does bring tears to my eyes. I really appreciate the honor. “Family Health Center has been a labor of love. It’s still a labor of love,” he added. Keeping the renaming a secret was no mean feat, according to Crawford. Walker lives nearby and is an active board member. In fact, he visited the Paterson facility twice in the days before the ceremony—days during which workers installed the building’s new sign. A combination of a tarp and staff shepherding Walker to another door helped safeguard the surprise. In another instance, a friend of Walker’s saw the new sign and promptly headed off to tell him; fortunately, Crawford caught the friend in time. The Moses L. Walker Building stands on the original site of FHC. In 2012, it expanded from a 23,000-square-foot clinic to its current two-story, 75,000 square feet of 104 examination rooms, offices, pharmacy and support space. Walker, then board chair, was instrumental in garnering $10.3 million to support that expansion. Today, Family Health Center operates six clinics plus two mobile units, providing medical and dental care to underserved populations in Kalamazoo County. To see a short video of the surprise dedication and unveiling of the sign, click here. 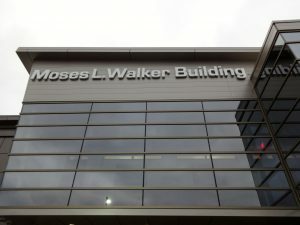 Photos from the Moses L. Walker Building dedication ceremony on October 27, 2017.